Sarath Amunugama was born on 10th July 1939 - the year of the beginning of World War Two. Since his father was by then a member of the Civil Defence Force, his earliest memories are of army uniforms and visits to the NAFI commissary where British branded chocolates were freely available. There was also a large collection of English magazines extolling British victories in distant places like El- Alamein and Tobruk. These were eagerly perused by the young schoolboy. Following the practice among middle class families of the time, our father was enrolled at Kandy Girls High School and continued his education there till he was given a double promotion to the third standard. The KGHS at that time was under the stewardship of Miss. Ruth Allan - a highly proficient teacher from the UK. On promotion to standard three he, and a cohort of boys now adjudged to be too old to continue in a girls school, were transferred to Trinity College which was the premier school in Kandy and one of the best schools in the island. Negotiating Chinese assistance in Beijing for the Norochcholai Coal Power Plant and Hambantota Port Development. On his left, Dr. P.B. 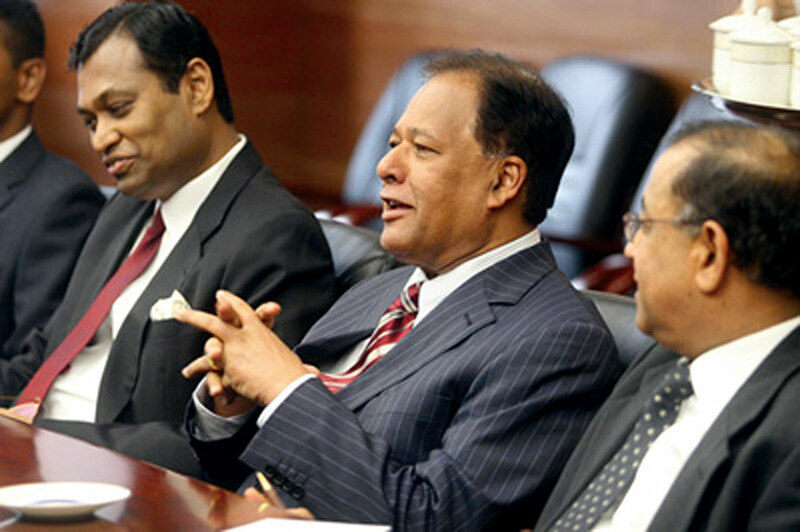 Jayasundera, Secretary to the Treasury and on his right, Mr. Karunatileka Amunugama, our Ambassador in China. When he entered Trinity its Principal was Mr. Simithraaratchy, a distinguished old boy, outstanding science teacher and a strict disciplinarian. However to the boys in Junior school he was a distant and somewhat forbidding figure. Their immediate supervisor and teacher was Canon Christopher Ratnayake who too was no mean disciplinarian. When moving on to middle and upper school Amunugama encountered nearly all the legendary teachers of the school, who laid the foundations for his future life. In middle school there was R.L. Kannangara and K.L.B. Tennekoon. In higher classes he was taught a wide variety of subjects by top rate teachers like Hensman, Breckenridge, Hardy, Sinnetamby, Gordon Burrows, Eliot, Armstrong, Jansze, Jacob and Sahayam. But perhaps the most influential was debonair Hillary Abeyratne - a personification of what every intelligent student would like to be. Leading them all was Norman Walter who with his inexhaustible energy, was everywhere. His deep concern for his students remains in the memory of all those who were in Trinity when Walter was Principal. Equally important was the galaxy of students of this period who went on to make a contribution to national life in diverse fields. Unlike in many Colombo schools, emphasis at Trinity was on character building and not exclusively on academic excellence. Nevertheless at about this time a large number of Trinitians entered the University - perhaps in record numbers when compared with earlier times. Along with Amunugama others like S.M.L. Marikkar, Jayantha Dhanapala, Nihal Kappagoda, Nihal Rodrigo, Chandra Monerawela, Mithra Jacob, Ananda Wickremeratne, Arjuna Aluvihare and Wimal Dissanayake entered the University of Peradeniya. Other contemporaries like Gamini Dissanayake, Anuruddha Ratwatte, Sarath Silva and Denzil Kobbekaduwa became nationally recognized personalities several years later.